Don't spend hours or a fortune to create a gorgeous table centerpiece that will make a lasting impression. Fresh flowers are always a good start. 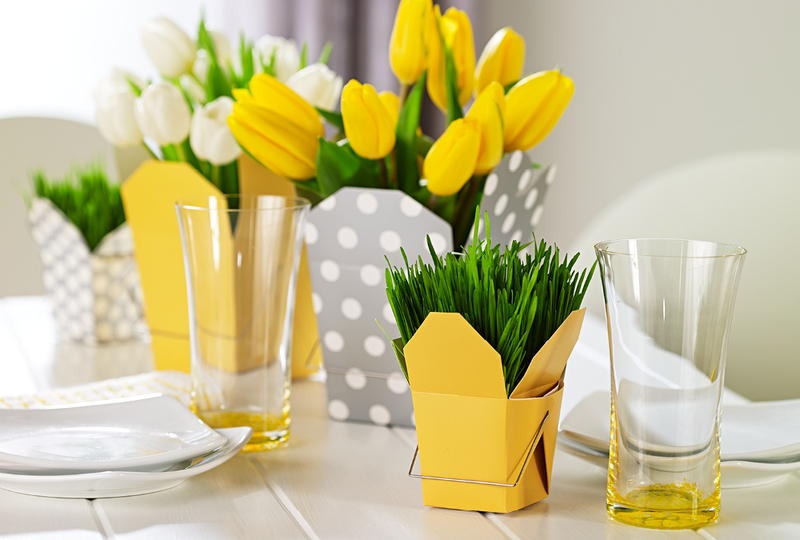 From there, you just need a few takeout-style boxes, small vases, and some creativity! You can purchase folding takeout boxes at your local craft or party supply store. They're available in many colors and patterns (photo a), so you can create a custom look that fits your color scheme. To use freshly cut flowers, simply arrange a few stems in a small vase filled with water, and place the vase inside a takeout container (photo b). Fill as many as you like to make your centerpiece more elaborate. We even mixed in a few takeout boxes of potted grass to play up the springtime theme. As an added bonus, you can also prepare charming hostess gifts or party favors using takeout boxes. Who wouldn't want to leave a memorable event with a box of candy or treats to go?